We have a week before we need to be out of the house, so I’m attempting to pack for France, along with allowing for clothes to wear here at home where it’s cold, and for our 10 days in Florida where it’s warm. The other day we received a box of vacuum storage bags. So today I spent time trying to see if all the clothes I plan to take will fit. A lot of times I don’t wear very warm clothes because I still get hot flashes. Many times I’m wearing short sleeves or sleeveless dresses with a cardigan so I can strip down at the first sign of inner flush. As I packed today, cramming sweaters and warm pajamas in the vacuum bags, I couldn’t help but wonder if I would even wear everything I’m taking along. I winnowed out so many things but I continued to remove dresses and shirts from my pile. On television, those vacuum bags look so smooth. Mine looked like vacuum-packed roasts. The bags are super heavy now, of course because there’s no air in them. I have another suitcase that I plan to pack for our days in Paris and I may take an extra bag to Florida. Before we leave there, I’ll have to fit all those summer clothes into my bags so I can get them to France. As all the dominoes fall into place, our dream of living in France gets closer and closer. And last week, the domino that made me nervous crashed into our neighbors mailbox. The French consulate in Chicago had warned that it could take four weeks for the visas to arrive. Since we would be closing on our house before a month had passed, I had the visas sent to my neighbor's house. I had already arrived at school to teach an evening class when she texted saying she had received an Express mail envelope for us. I wanted to run right home to get it, but instead, I sent Earl to fetch them and he took a picture, texting it to me in class. Yay! We are going to live in France. I also bought train tickets today for our first journey from Paris to a housesit in Nouvelle Aquitaine. Of course, I don't want to have to print off all our train tickets, so I downloaded the app for SNCF -- the train system in France. Now we scan our tickets before climbing aboard, or when the conductor comes down the aisle. We can also keep track of all of our train trips on the app, and it's counting down the days for me. In other preparing to leave news, today we pulled out the suitcases and opened them on the floor. We went through our closets, which we thought we'd winnowed out before the house went on the market, but we continued to find things that we could live without. Clothes are laying in a pile in the suitcases, ready for the compression bags that I ordered from Amazon this morning. Hopefully, those magic compression bags will make everything fit. Just a few weeks until we close on our house and less than a month until we leave Columbus behind. We'll travel to my parents' house to celebrate Christmas, and in January we'll fly to France. It could still all fall apart, but I'm feeling pretty confident now. During this busy holiday weekend, just a pause to tell you that things are better. If Spencer and his girlfriend start their morning with Echinacea tea, I feel like everything will eventually fall into place. Had a lovely, if loud, Thanksgiving with my family. My parents from Florida, my brother from Texas, and my nephew from Virginia with his 4 children, including these two little guys. Now you see why it was loud. Plus their sisters, 3-year-old Lydia and 2-year-old Lorelei. Today, back to my brother’s to celebrate my mom’s 80th birthday. I am dreaming of France. My husband has a countdown and we are scheduled to fly to Paris in 45 days, but sometimes I wonder whether it will happen. My biggest worry isn't about what I should do with the crystal candle holders or the salt and pepper shakers. My greatest fear is that my kids aren't ready to face life on their own. Oh, they're old enough at 25, 24, and 21, but so many times they turn to us for help or with questions. Right now, I have a twitch in my left eye, and my stomach is roiling as if I might get sick as I sit and worry about one of my boys. They both decided to travel this weekend, Tucker heading to Detroit, nearly 3 hours away, for an art show, meeting a friend who goes to school there. On his way home, as the rain began to fall and the wind picked up, he topped a hill and saw a pile-up in front of him. He slammed on the brakes and swerved to the left toward the shoulder of the road, but a car was already parked there. His car continued to travel, eeking between the median and the parked car before it stopped. Heart racing, he called to tell me about his near miss. He stopped by today after work to give us a hug and further regain his equilibrium. The almost accident had shaken him up. Spencer visited his old college this weekend. His friend had a birthday,and he needed to celebrate with him. I asked him not to go. Every time he goes, something bad happens. Last time it was a rear-end accident, not bad, but he got a ticket and although the person's car had no damage, she filed a claim for a soft-tissue injury. "It's not going to be like that this time," he promised. And, although he forgot to text me when he arrived at his friend's apartment 90 minutes away, he texted on Saturday morning to let me know that all was well. Today, Sunday, Earl and I had planned a day packing up things in the house. We only have two more weekends and one of those is the holiday weekend. We need to prepare to get out of our house. But first, we went to buy some new shoes for Earl that he can take to France, a pair of slip on casual shoes and a pair of hiking boots. As we moved toward the checkout counter, my phone rang. Spencer said that his car had been towed. He wanted to know the license plate number so he could check the impound lot. I didn't know the license plate number, but the insurance card had the ID number for the car. I texted him a picture of the insurance car. "How much do you think that will cost?" I asked Earl as we drove home. "More than $100," he said. Spencer got his first paycheck from his new job last week. At least we wouldn't have to pay for it, but that wasn't how he should be spending his money. A few hours passed as we sent and received texts from Spencer. Then Earl called to talk to him. He'd been drinking all afternoon as he tried to find his car. I walked into the bedroom and called him. His voice was slurred and he inhaled deeply on a cigarette as we talked. I felt my blood pressure shooting up. How was he supposed to find his car if he was drunk and how would he drive home if he did find it? I read him the riot act. "You are forbidden to go to Athens again!" I told my 24-year-old. "You apologize for making bad decisions and then you go back and make more." He stumbled over his apologies. "We're going to have to take care of it," I told my husband. He called the campus police who said only three towing companies tow from on campus. My husband called all three. None of them had towed the car. We had to face the fact that his car, a 2014 Honda Accord which we purchased in May, must have been stolen. We called him back and told him to sober up, report the car stolen to the police department and get on a bus back to Columbus. The bus left at 5:40, would he be on it? Had his phone died? He didn't text. When we called, it went to voicemail, but only after ringing, so it must not be dead. Finally, just a few minutes before I finished writing this, I got a text from him. "Still can't find it." "Can you call?" I texted back. He sounded better but still confused. He had missed the bus. There's another one at 5 in the morning, but how would we be sure he was on that bus? We couldn't risk it. He had to keep his new job if we hoped to move to France; he needed to be home. Earl offered to drive to pick him up. An hour and a half both ways. It's cold, but it isn't raining or snowing. But it's dark and it will be late when they get home. I know this isn't a happy post about moving to France, but it's probably my greatest fear about leaving. Some of you might say to let him to figure it out on his own, and if we weren't moving to France, maybe we wouldn't save him. But if he doesn't have a good job and his own apartment, leaving on our adventure becomes much harder. And I realize that it isn't his fault if the car was stolen, it's the getting drunk in the middle of the afternoon when he should be dealing with the incident that bothers me the most. Part of me thinks that our departure will be the moment our kids grow up once and for all, knowing that there isn't a safety net here for them. They'll sink or swim on their own. Please, God, let them swim. Since Spencer called, my stomach is no longer in danger of losing its contents. I'll be happy when I know that Earl has him safely in the car, but my eye is still twitching. Maybe it will continue until we get on that plane to France, in 45 days. Update: As Spencer was walking to the police department, he decided to check one more parking lot and found his car -- not stolen, not towed, just parked in a place he didn't remember. I'm not sure if that is a happy ending, or just points to more worries about my kids. Yesterday, the phone rang and I saw my real estate agent's name flash up on the screen. "Oh, no." I'd been dreading her call. It was the day we were supposed to get the results of the appraisal. A previous offer had fallen through at the appraisal stage. We figured at best we'd have to negotiate for a lower price. The agent didn't beat around the bush. "We appraised for asking price!" she crowed. No more negotiating, no more bargaining, we had successfully jumped through all the hoops. We close on the house on December 8. Well, I'm not going to try to build up any suspense. We traveled to Chicago this week and applied for our Visa. 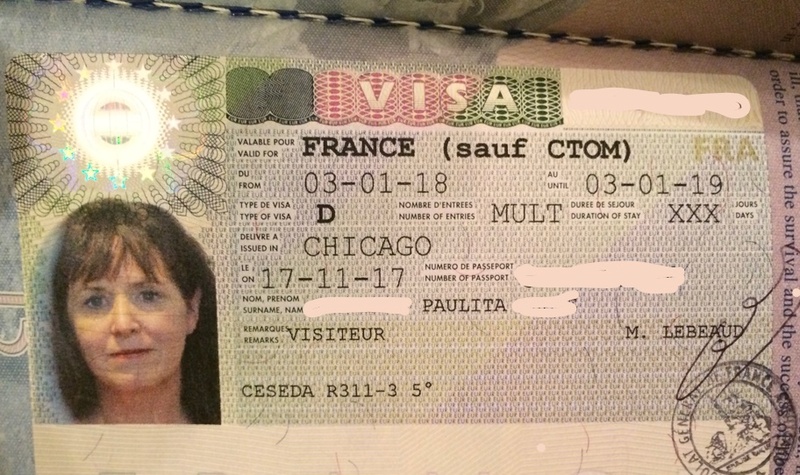 Chicago is about five hours away from us, but it is where we needed to travel for our in-person interview to request a long-stay visa. In general, Americans don't need visas to visit France for three months or less, so we've never had to do this before. We spent the night with some old friends who live about 20 minutes outside of the city. We took the train in early Thursday morning. Our appointments were not until 11 and 11:10 (we both had to have appointments), but we just commuted when our friend went to work at 8 a.m.
That gave us time to find a place for breakfast. We were lured into a place that had a chalkboard sign that read "Homemade pastries" but when we got inside, I asked where the pastries were and they had none. What they had instead, was a breakfast buffet that you paid for by weight. Weird, huh? I also had a birth certificate, just in case. After breakfast, we decided to walk to the consulate, which is on Michigan Avenue, down toward the Magnificent Mile. Even though we arrived at the building nearly an hour early, I wanted to go ahead and check in. I felt nervous, jittery. Earl suggested we get something to drink at the Starbucks on the second floor, but I wanted to head to the 37th floor to the French consulate. So he acquiesced. The information desk gave us a pass to get through the gates to the elevators. We were supposed to scan the pass and glass doors slid open to let us through. But I scanned my pass and the doors turned red, but I pushed on them anyway. Suddenly, a loud blaring noise rang out and a man with a walkie talkie came rushing toward us calling, "Step back." They'll never let me into France now, I thought as the man took my pass and scanned it before allowing me through the gates. A few seconds in the elevator, which made my ears pop as it zipped up to the 37th floor, and we stepped off into France. Proof that we were in the right place. Here's me in those same chairs. A young man, who was returning to the office, told us we should put our passes in a deposit window, like a bank. The two women behind the windows lined up the passes, probably in order of people's appointments. The office was very small with a television mounted in the corner. It played French food shows the whole time we were there. A man and two children were there when we arrived, and another man, French, jumped ahead of the line to get his passport, but almost everyone else there was a student getting a visa to study abroad. And the majority of those students were Asian. Perhaps they were studying in the U.S. and wanted to do a study abroad, or maybe they came from countries that needed a visa to visit France. At a little after 11, the younger woman motioned me up. She didn't try to pronounce my name, but her microphone wasn't working so we hadn't been able to hear her all morning anyway. I pulled out the packet of papers and asked whether she wanted all of them. Yes, she nodded. So I slide the inch-thick stack through the window and she slowly went through each one. She handed me back the extra passport photo and my birth certificate, and the envelope that my $115 cash was in. Earl took a picture of me standing at the window as I supplied my papers. Then she asked to get my fingerprints. They had a machine that didn't require ink or black-tipped fingers, but it was quite contrary. It took several times and kept beeping at me as I tried to get the machine to light up for all four fingers, and then the other hand and then both thumbs. While we were there, no one else had to do the fingerprint machine. It must only be for people planning to move to France. The woman then nodded and said I could send my husband up. So Earl replaced me and supplied all of his papers. After his wrangling with the fingerprint machine, we were free to go. Some of the students applying didn't have what they needed, so the workers had sent them out to get things like cash for the fee or envelopes for mailing the visa. We had all our documentation, so that's a plus. Earl picked up my coat and held it for me. As I slipped my arms in, I saw the French woman behind the window smile at us. She thinks we're cute, I thought. Then I wondered if she thought there was no way we were getting a visa to move to France. Just because we had all the right forms does not mean that they'll let us move to France. I think our odds would have been much better if we had closed on our house and could show them a bank statement with $150,000 in it. But the closing is not until December and the visa can take a month to arrive. We couldn't risk waiting. So now we'll check the mailbox starting next week, hoping our visas arrive. I didn't think about it until recently, but we left our passports there, along with our marriage licenses. I hope we get them both back. before we walked to the Nutella cafe across the street. I'm sure it was strategically placed close to the French consulate. Earl had a Nutella and banana crepe while I had a berry pastry that I didn't realize would be drizzled in Nutella. I think I'd have preferred it without Nutella, but we celebrated because we were a step closer to making our dream come true, where we can eat really pastries without Nutella on them. If you know me at all, you would suspect that I would dive right into One Sip at a Time by Keith Van Sickle. 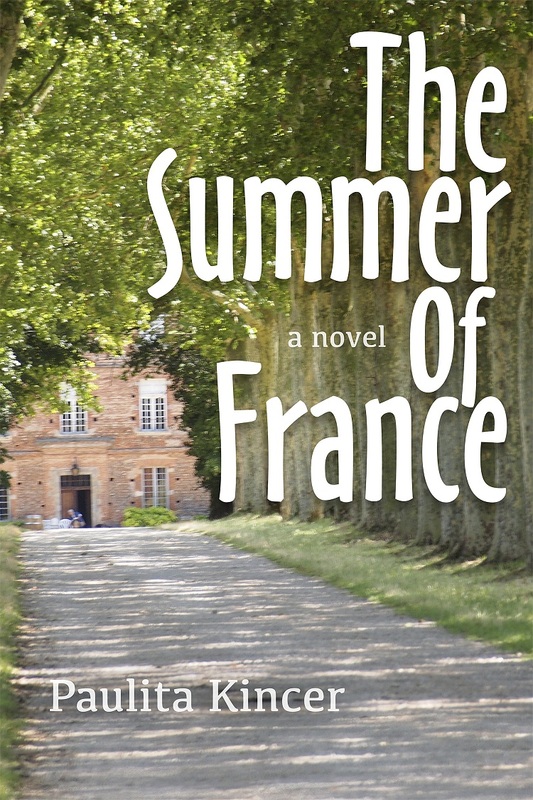 This book is full of the author's observations of life as he and his wife move to Provence. They had already lived along the border of Switzerland and France, so they were not strangers to living abroad. Each story is a short snippet, like a blog post, and they are all joined together to create a small memoir, which is nice if you only have short bursts of time to read. The author covers the major stumbling blocks that ex-pats face and does it in an entertaining, tongue-in-cheek manner. He addresses situations like driving in France, learning the language and making friends. In the section titled "The French Citizenship Test," I wondered if the author and his wife were actually becoming French citizens, but instead, he talked about the challenge of eating a croissant without leaving messy crumbs. Yes, I can see that would be a challenge, and perhaps the ultimate test to become a French citizen. One chapter I found interesting was about the presidential election in France. When we visited France in May, they had just elected Macron. Van Sickle writes about the election of Hollande, so a few years before. Like us, he was impressed by the shortness of the election. If you're curious about life in France and interested in a light-hearted look at it, One Sip at a Time can take you there. Make sure you scroll down and enter to win a copy of the book. Can a two-career couple really pick up stakes and move to Provence? Keith and Val had a dream – to live in Provence, the land of brilliant sunlight, charming hilltop villages and the deep blue waters of the Mediterranean. But there were two problems: they weren’t French speakers and they had full-time jobs. So they came up with a plan… Follow their adventures (and misadventures) as they quit their jobs, become consultants and split their time between two countries. 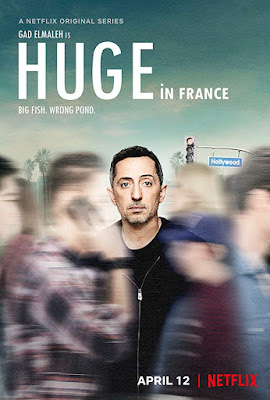 Laugh along as they build a life in Provence, slowly mastering a new language and making friends with the locals over long meals and just a bit too much wine. If you’ve ever dreamed of changing gears and learning what joie de vivre is really all about, you won’t want to miss this delightful book. This is the week we travel to Chicago to apply for our Visa that will allow us to stay in France for a year or more. We could have applied anytime within three months of our departure, but we picked the date this week because the house was originally scheduled to close on Tuesday. We thought to deposit the money from the sale of the house and then print out our bank statement as proof that we have enough money to live in France for the coming year. We kept our appointment, even though we won't close on the sale of the house until December 8. The visa can take a month to get, so we didn't want to risk not getting the paperwork in time. First, let me say that Americans don't need a visa to visit France. It's only for long-term visits, like going to school or moving there that Americans need a visa. I took this out the window of the plane on our last flight, knowing that was the day we'd land in France. 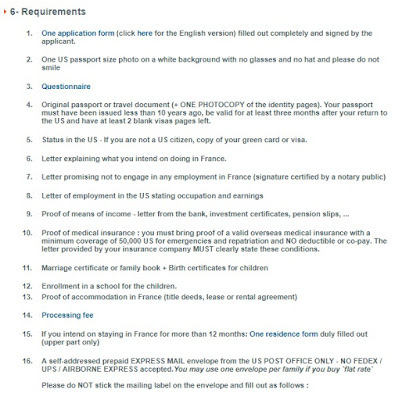 I searched online and found that Earl and I have to apply for a visa at the French consulate in Chicago. Chicago is about five hours away from us, so that isn't terrible. Plus, we have friends who live there so we can stay with them. 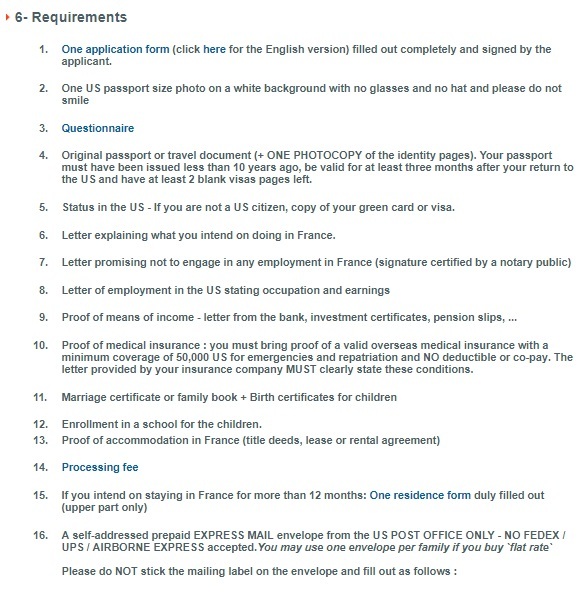 The consulate has a whole page on its website about how to apply for a long-stay visa. I made the appointments before we had all of our documents ready, but I figured that would give us incentive to get everything done. Just today I headed to CVS to get a new photo taken. I had extra pictures printed when I renewed my passport in July, but since the instructions for the Visa say the picture has to be with three months, I didn't want it thrown out on a technicality. On Friday, we had our friend who is a notary notarize all of our letters that declared we're American citizens, that promised we won't try to find work in France. We ordered a birth certificates and two marriage certificates, one for each of us. Just last week, after perusing the health insurance available, I ordered and paid for a year's worth of insurance. If you aren't American, you may not realize how amazing that is. Here, even though we get our insurance through Earl's work and it is good insurance, we pay about $225 per week. That's about $900 per month that comes straight out of Earl's paycheck. 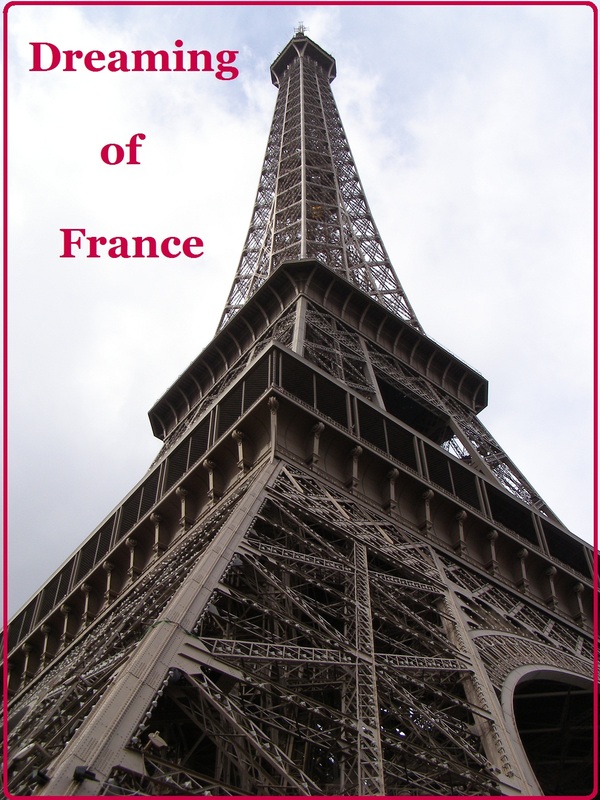 I filled out the forms with Mondassur, an insurance broker, which an Australian living in France had told us about, and our insurance bid came in at 846 Euros for the year for both of us. The price we paid in American dollars was $956 -- for the whole year for two people. That is amazing, and I had no problem seeing that money disappear from our account. Today, I opened the folder that holds all of our important documents and I put them in order as listed above. I still need to get an Express Mail envelope to take with us. I've been super nervous about applying for the Visa, especially since we haven't closed on the house yet, but I found a blog post by a man who successfully applied and received a Visa. He was very reassuring at MadManBlog. So, tomorrow is the appraisal on our house -- possible the last time we have to stage it (fingers crossed). If all goes smoothly, we'll receive our Visas within the month so we can fly off to France in January. And then, you'll find us there, beginning our new ex-pat life.